It’s no secret that I am a pretty big geek. I’m also a fan of gadgets. Today, I am collating a list of 5 gift ideas for gadget mad adults! The list will contain items which are under £100 RRP, so they won’t break the bank, and will make ideal Christmas or Birthday treats! Let’s get the ball rolling then….. The first item I’d consider is both geeky and functional. Dash Cams have been around for a while now, and they can make the headache of car accidents much less stressful, as they can prove exactly what happened without the need for independent witnesses. 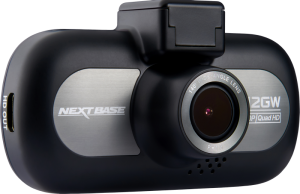 I was recently sent the Nextbase 412GW, and will be sharing a review of that in due course. It has an RRP of £130, but is under £100 on right now. This model is endorsed by the AA, and would be perfect for any motorist in your life. I am a massive Nintendo fan, and I got both the NES mini and the SNES Mini consoles last year. 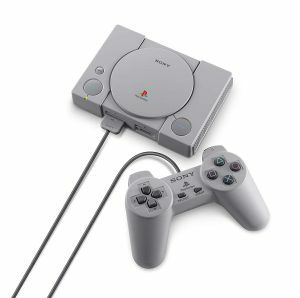 This year, Playstation has joined the classic revolution, and released the Playstation Classic last week. If there’s a Nintendo or Playstation fan in your life, they are sure to love these. 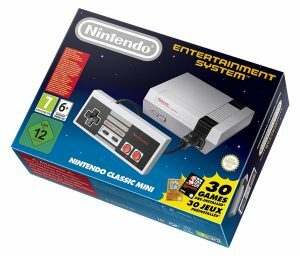 This console is under £50, but is packed with amazing 80s nostalgia. It looks just like the original Nintendo entertainment system has been shrunk, but all the fun is still there. It includes 1x full size original style NES controller. (You can buy another to add 2 player functionality to the console). The leads are really short on the controllers, so you’ll have to position the console close to you, or sit close to the TV to play. (Or buy the – which is compatible with both of the mini Nintendo consoles). It has these games crammed into the tiny device: Balloon Fight, Bubble Bobble, Castlevania, Castlevania II: Simon’s Quest, Donkey Kong, Donkey Kong Jr., Double Dragon II: The Revenge, Dr. Mario, Excitebike, Final Fantasy, Galaga, Ghosts’N Goblins, Gradius, Ice Climber, Kid Icarus, Kirby’s Adventure, Mario Bros., Mega Man 2, Metroid, Ninja Gaiden, PAC-MAN, Punch-Out!! Featuring Mr. Dream, StarTropics, Super C, Super Mario Bros., Super Mario Bros. 2, Super Mario Bros. 3, Tecmo Bowl, and The Legend of Zelda Zelda II: The Adventure of Link. Is this ideal for the gadget mad adults in your life? 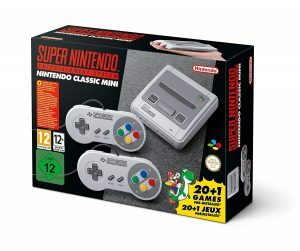 With an RRP of £79.99, this classic games console is a little pricier than the NES version. It does come with 2 controllers though, so works out roughly the same if you were going to buy the spare controller for the NES Classic. The SNES Classic is packed with classic Super Nintendo games, which were released in the early to mid 90s. The included games are: Contra 3: The Alien Wars, Donkey Kong Country, EarthBound, Final Fantasy 3, F-Zero, Kirby Super Star, Kirby’s Dream Course, The Legend of Zelda: A Link to the Past, Mega Man X, Secret of Mana, Star Fox, Star Fox 2, Street Fighter 2 Turbo: Hyper Fighting, Super Castlevania 4, Super Ghouls ‘n Ghosts, Super Mario Kart, Super Mario RPG: Legend of the Seven Stars, Super Mario World, Super Metroid, Super Punch-Out and Yoshi’s Island! The leads are longer on this classic console, so you probably won’t need extension leads. I love this console, and spent hours replaying Mario, Mario Kart, Zelda and Donkey Kong Country when I got mine. The PlayStation Classic console only came out this week. I was really excited about it, but when I saw the list of games and controller style, I was disappointed. The original Playstation featured analogue controllers, but when dual shock ones were released, Playstation went from good to great, in my opinion! The classic comes with 2 of the analogue style controllers. The included games are: Battle Arena Toshinden, Cool Boarders 2, Destruction Derby, Final Fantasy VII, Grand Theft Auto, Intelligent Qube, Jumping Flash!, Metal Gear Solid, Mr. Driller, Oddworld: Abe’s Oddysee, Rayman, Resident Evil Director’s Cut, Revelations: Persona, Ridge Racer Type 4, Super Puzzle Fighter II Turbo, Syphon Filter, Tekken 3, Tom Clancy’s Rainbow Six, Twisted Metal, and Wild Arms. I was sad to see Grand Turismo, Tomb Raider, Crash Bandicoot, Spiro, Silent Hill and Alundra didn’t make the cut. Out of the included games, I only played Abe’s Odyssey, and while it was good, I didn’t fancy spending £90 to reminisce. If you know any gadget mad adults who loved Tekken, GTA or Resident Evil, they’ll definitely love it though! If you’re shopping for a gadget mad relative, why not consider getting them some smart home items? If they already have an Amazon Echo, for example, you could get them some smart plugs so they can control their devices or lights from their phone! (Being able to switch on your lamps or the radio via your phone when you’re out is a great security feature, as well as being convenient)! They work really well for Christmas lights too! 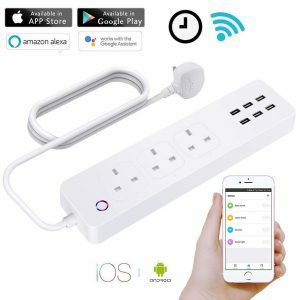 This allows you to plug in 3 standard UK plugs as well as 6 USB devices, and you can control them, via your smart device or phone. I love that you can ditch the plugs for your phone and smart watch and just plug the USB cable straight into the extension lead, too. I hope these gift ideas for gadget mad adults have been useful for you? Have you got any other suggestions? If you liked this post, why not check out more of my Geeky Stuff here?